The opera Carmen was based on a novella of the same title written in 1846 by Prosper Mérimée. 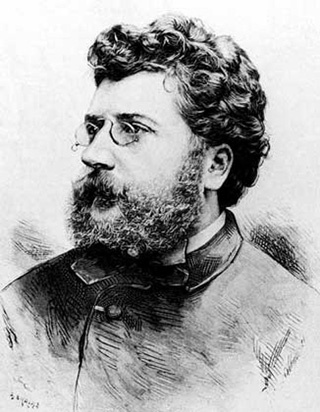 Bizet began work on it in the summer of 1873, and finally finished it late in 1874. It was a time of great emotional strain for him. His marriage was beginning to break up and during the composition he was separated from his wife for two months. It was premièe;red on 3 March 1875, and, even though it ran for 48 performances, was not initially well-received by the critics. The subject matter was considered improper, particularly the idea of a soldier deserting the army to join a criminal band of smugglers. Sadly, Bizet did not live to see Carmen's success. He died from a heart attack at the age of 36 exactly three months after the première, on his sixth wedding anniversary. The opera did however quickly gain admirers. Praise for it came from well-known contemporaries including Saint-Saëns and Tchaikovsky. Brahms attended over twenty performances, and considered it the greatest opera produced in Europe since the Franco-Prussian War. Even Wagner praised it grudgingly. Carmen has since become one of the most popular works in the entire operatic repertoire, and undoubtedly the most famous operatic portrayal of the "femme fatale". Carmen's success is due to a number of factors. On the surface it is written in a popular style with strong melodic ideas inflected with Spanish and Latin American idioms. More significantly it has very subtle musical characterisation. The fated hero, Don Jose's music is filled with intense passion, contrasting with the lighter fickle writing that characterises Carmen. Equally strongly drawn are the deeply sincere Michaela and the arrogant toreador. The subtlety of the music is matched by Bizet's unerring sense of the stage and drama. A good example of this is the opera's unforgettable final scene. Prosper Mérimée's novel finishes with Carmen's murder in a lonely spot in the hills outside Seville, but Bizet, in a stroke of genius, brings the action to outside the bull ring, contrasting the horror of the murder with the enthusiastic outbursts of the off-stage chorus. Two Carmen suites were published for orchestral performance after the composer's death. The sequence adopted for this performance is based on the first suite, with the addition of the Habañera from Act 1 of the opera. The short prelude presents the threatening fate motive that occurs frequently throughout the opera, most significantly at the end. The Aragonaise describes the lively street scenes in Seville before the start of the bull fight. The Intermezzo is the central point of the opera. Coming before the opening to Act 3 it expresses Don Jose's deep love for Carmen in a short moment of calm when their relationship seems secure. It contains one of the most beautiful melodies ever written for the flute. The seguedille is a Spanish song and dance that Carmen uses to seduce Don Jose into releasing her from prison. Les Dragons d'Alcala is march in a 'toy' military style that opens the second act. The habañera, which is perhaps the most famous aria of the opera, is sung by Carmen in Act 1, and fatally attracts Don Jose. The tune was taken, with acknowledgement, from a popular contemporary Cuban dance composed by Sebastián Yradier. The Latin American idiom and the rich orchestration give it a seductive character, yet the chromatic movement in the melody make it intangible and slippery, suggesting the unattainable. The final movement describes the brilliant parade of the Toreadors on their way to the bull ring in Seville. The Carmen Suite was performed by the Portobello orchestra on the 14th March 2009, conducted by Anthony Weeden.